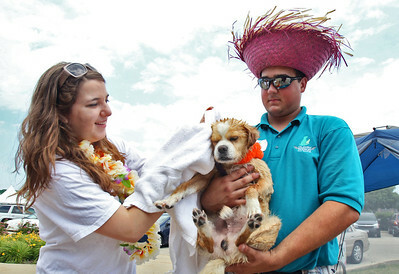 Sarah Nader - snader@shawmedia.com Ron Beres (right) holds his foster dog, Roger, whole volunteer Anna Fredrick, 17, of Fox River Grove dries him off after a bath during the All About Dogs Luau and Pet Adoption hosted by On Angels' Wings in Crystal Lake on Saturday, June 16, 2012. Roger is a six years old, mixed unknown breed and is available for adoption. Sarah Nader - snader@shawmedia.com Susie Eichhorn of West Dundee comforts her dog, Sadie, while she gets her nails cut while attending the All About Dogs Luau and Pet Adoption hosted by On Angels' Wings in Crystal Lake on Saturday, June 16, 2012. The event featured activities include agility training, treats of all kinds, $5 nail trims, $5 dog baths, $10 pet portraits, $10 "dog tags" for humans, samples of dog food and supplies from local vendors, games for humans and their four-legged companions, and music by DJ Mark. Sarah Nader - snader@shawmedia.com Owner of Erin's Mobil Pet Grooming, Erin Hogue, trims a dogs nails during the All About Dogs Luau and Pet Adoption hosted by On Angels' Wings in Crystal Lake on Saturday, June 16, 2012. 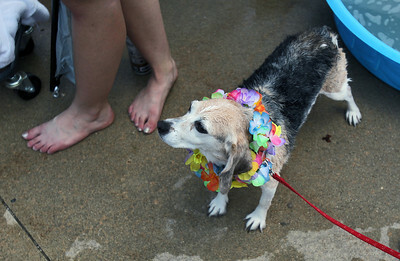 Sarah Nader - snader@shawmedia.com A six year old beagle named Peppermint Patty dries off after getting a path while attending the All About Dogs Luau and Pet Adoption hosted by On Angels' Wings in Crystal Lake on Saturday, June 16, 2012. 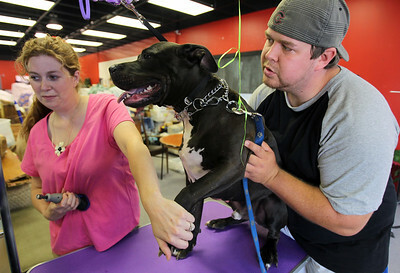 Sarah Nader - snader@shawmedia.com Josh Wilson (right) of Cary holds down his dog, Keno. 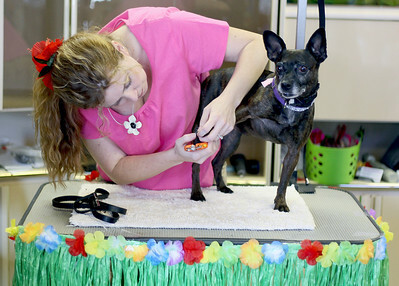 while Erin Hogue, owner of Erin's Mobil Pet Grooming trims the dogs nails during the All About Dogs Luau and Pet Adoption hosted by On Angels' Wings in Crystal Lake on Saturday, June 16, 2012. Owner of Erin's Mobil Pet Grooming, Erin Hogue, trims a dogs nails during the All About Dogs Luau and Pet Adoption hosted by On Angels' Wings in Crystal Lake on Saturday, June 16, 2012.